Barbora Spotakova, the 2007 World, 2008 and 2012 Olympic champion, 2014 European champion and the current world record holder in the javelin, was a heptathlete in her early career. Her first major selection was for the 2000 World Junior Championships, in Santiago, Chile, where she finished fourth (5689 points). But she has focused on the javelin throw since 2004 after being encouraged to do so by a Bahaman coach during her American studies at the University of Minnesota, and by the javelin legend, Jan Zelezny. “Try javelin,” Zelezny, the men’s world record holder, from her home country, told Spotakova. Spotakova had started in athletics at school, in Jablonec nad Nisou, where she was led mostly by her mother, Ludmila Spotakova. Barbora considers this period of her life very important. “I was not pushed into anything and nothing was lost, I got all-sports basics,” she said. Together with her mother she moved to the Czech capital, where she attended a Grammar school focused on sports. In the school, where most top Czech athletes have studied, she tended towards the hurdles under the leadership of a coach Petr Cech. In 1999, she started to train regularly for combined event competitions, which suited her versatile talent. After her success in Chile, Spotakova decided to study in the USA for a while. At 21, Spotakova got the first chance to perform at her first big senior meeting, the European Championships, in Munich, in 2002. The Czech federation chose to send young athletes who had reached the qualification standard for U23 championships. Spotakova was picked for the javelin even though she did not start to concentrate on it until towards the end of 2003. Surgery in the autumn of 2003 to remove a benign tumour would be followed by two seasons with a painful knee. 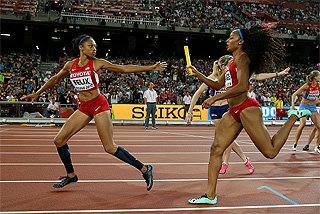 However, as 2003 drew towards a close, Zelezny advised her to pay more attention to the javelin and he invited her to a training camp in South Africa in the spring of 2004. Spotakova did not leave combined events easily. In 2004, she tried decathlon just for fun at the end of season, and achieved 6749 points in Talence. At the 2004 Athens Olympics, the athlete, whose personal best for heptathlon is 5873 points (in 2000 in Prague), did not yet draw attention to herself as a javelin thrower. She was eliminated in the qualifying round. The most interesting part of Spotakova’s career started symbolically in the year when Jan Zelezny ended his brilliant career. The “era of Zelezny” finished and the “era of Spotakova” began. 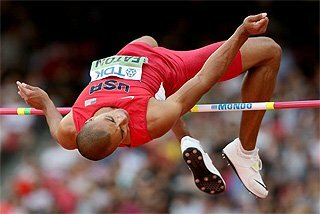 One of the measures of athletics immortality is the Olympic Games. Would a new Dana Zatopkova (the nation’s last women’s champion in 1952) be born at the 2008 Olympic Games in Beijing? The athlete, who was coached by Rudolf Cerny at that time, improved the Czech record three times during the 2006 season and lost only 5 of 17 competitions. She achieved 6 of the 10 longest throws, including a Czech record (66.12) in the qualifying round of the European Championships in Gothenburg. In the final, she was second (65.64), 23cm behind Germany’s Steffi Nerius. However, Spotakova avenged the defeat at the World Athletics Final, in Stuttgart, with a winning 66.21, another national record. At the end of the year, she received an offer to become a professional member of the Czech army. She agreed and became a Chief Warrant Officer. Spotakova improved her national record twice in the final of the 2007 World Championships, in Osaka. She threw 66.40 in the first round to lead and 67.07 to secure the gold medal. Barbora became the seventh woman in the world to reach 67m. She then improved this mark to 67.12. 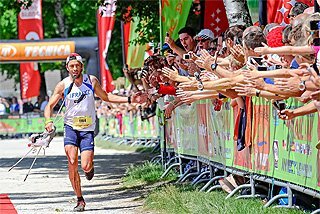 The year was rounded off when Spotakova took the title of the best 2007 Czech athlete, defeating Roman Sebrle, and was second among all Czech sportsmen and women. In 2008, Spotakova rose to N.4 on the all-time list, improving the Czech record to 69.15 in Zaragoza on 31 May. That mark led the year’s Top Lists going into the Olympics and she also had the second best distance after throwing 68.81 on 16 June, in front of her home crowd at 15th Josef Odlozil Memorial in Prague. “The Olympic gold will take 70 metres,” said the 27-year-old Czech medal hope. For all these results, the member of Dukla Praha army sports club was promoted to First Lieutenant by the Czech Army in September 2008 and rewarded as the best Czech sportsperson of the year in January 2009. Spotakova is not concerned what the future may hold for her beyond her life as an athlete. “Athletics was not my priority, even two years ago,” she said in 2008. “I have always studied and I already got a university degree. It is better when you do also something else than only athletics. 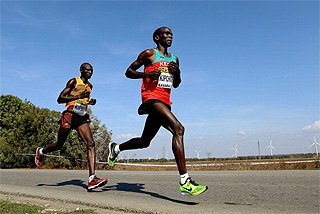 Only athletics would not be enough for me.” Thus, in May 2009, the Olympic champion successfully finished a master degree at the Czech University of Agrobiology in Prague, field of study - Living environment. Due to all the formal duties, the Czech superstar felt exhausted at the beginning of 2009. Fortunately, popular Spotakova managed to handle it very well. The Josef Odlozil memorial in Prague in early June was very productive, and Barbora improved her season best to 68.23. Later, she traditionally attended the Ostrava Golden Spike meeting, where she took third place with 65.92, and she improved this placing at the 1st European Team Championships in Leiria, finishing second with 65.89. At the end of July 2009, Spotakova felt a bit tired after a hard preparation for the World Championships in Berlin, but still hoped she was able to tune up the fitness to defend the world title from Osaka 2007. “I am very satisfied with my performance in Monaco, but on the other hand, I feel very tired. I trained a lot. Even my elbow and my Achilles tendons are tired. Maybe I trained too much,” confessed the world record holder. Before her departure for Berlin, Barbora planned a training camp in Nymburk and then just a “crocodile week” when the athletes wait for the golden shape. Bara, as friends call Barbora in Czech, knew how hard it would be to repeat the previous season. At the end of 2009 she also called it “the silver year”. Especially because of her silver medal at the World Championships in Berlin. Although she did not have her day in the German capital, she fought in the sector with her opponents. After the initial 64.94 from the first series, she posted the longest throw, 66.42 - unusually in the third series. "I did it, I'm happy. The medal is not bittersweet; each medal from the World Championships is valuable. It would be nice to be just golden all the time, but it is impossible always to win. It's a sport, and therefore people watch it," she said after the event. Still she managed to defend her victory from 2008 in the poll of Czech Athlete of the year, as the only Czech medallist from Berlin. 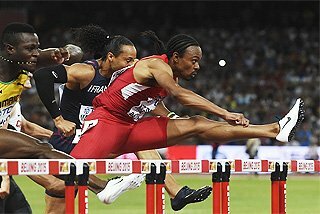 In 2010, Bara became an ambassador of the new athletic series – the IAAF Diamond League. Among her main achievements in the season belonged the victory in the Diamond Race. However, an elbow injury aggravated at the meeting in Monaco greatly limited the attack to gain the European champion title. In Barcelona, she took bronze for the performance of 65.36. "The most important for me is the fact I got a medal. I appreciate it a lot. The season was tough and since my elbow is not OK, I am happy. Every medal is a success. In my career, I've basically had no easy competition," she summarised. At the end of the season, Barbora Spotakova announced a change of her coach; she turned from Rudolf Cerny to her idol, Jan Zelezny. She became also the best Czech athlete of the year for the fourth year in a row. There were two main goals for the Czech world record holder in 2011 – to become a world champion and to win the Diamond League. With her new coach and colleagues from the training group – javelin throwers Petr Frydrych, Vitezslav Veselý, Jakub Vadlejch and Jarmila Klimesova, she spent two winter months in South Africa, even if she did not like it last time - eight years ago. “I decided to go there because my boyfriend Lukas Novotny could come to visit me for 10 days. So it was more acceptable for me,” she described. The start of the season had to be postponed for Spotakova as she suffered intestinal problems. Barbora has always had the plan to qualify with the first attempt into the final and she fulfilled it at the Daegu World Championships, throwing 63.40. 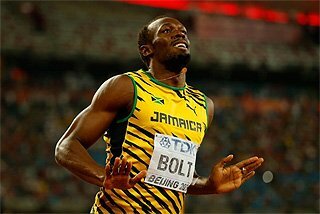 “I arrived very relaxed to the stadium and had a technically not very nice attempt. 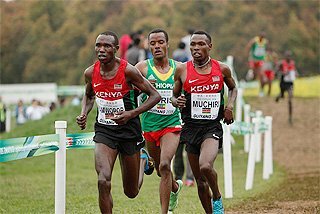 It was the hottest conditions I have ever competed in and I did not feel good. 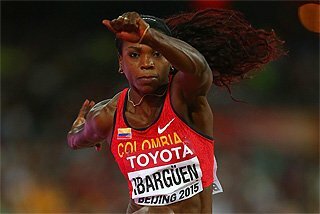 There must be a different Bara in the final if she wants to fight for medals,” she commented in Korea. The final turned into one of the greatest battles in the history of women’s javelin throw. 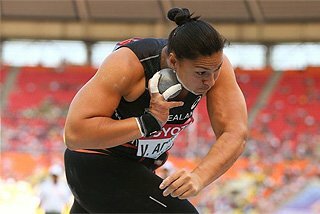 Despite posting the second longest throw in her career, 71.58, the world record holder achieved only silver on the hot August night. Russian Abakumova managed to improve in the fifth attempt to 71.99, the second furthest throw in history to win gold for Russia. But Spotakova’s amazing series (68.80 - 67.90 - 68.64 - 67.12 - 71.58 - 66.80) did not leave her disappointed and she enlarged her unique medal collection dating from Gothenburg 2006. “How can I describe it? It was a crazy but amazing competition; nobody would have expected such long throws. Frankly, in a few moments I was afraid for my world record. But my coach Jan Zelezny still believes I am able to throw even further. I was expecting throws around 70 metres here, so 71 is a great performance. Abakumova surprised me a lot, so it seems I would need to start to train for 73 metres,” she smiled confessing she did not expect to be second with 71 metres. “I really thought after my longest fifth attempt that I was the winner. But that was a mistake. 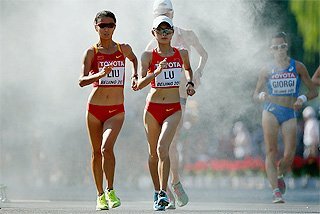 It was a good lesson for the whole life.” Later, she called the race a “silver competition with golden fragrance”. Six seasons, six medals. That was the record of the Czech favourite before the London Games. The successful representation is important for Spotakova’s diplomatic future. At the end of October, she started her Olympic training and announced she felt healthy and ready. As agreed with Jan Zelezny, they did not count with participation at the European Championships, in Helsinki, and she focused on her main goal. But she did not miss the Diamond League meetings in Doha (second with 66.17), Rome (first with 68.65) and New York (finishing second with a solid (68.73). But the special competition came at IAAF World Challenge meeting in Ostrava on 25 May. In front of the friendly crowd, Spotakova managed to break the spell and won after four years of missing the top spot. Her 67.78 was the new Golden Spike meeting record. “Javelin throw is a strange event. To feel good does not mean to throw well. 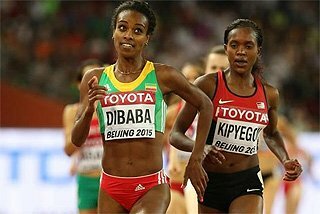 But I can say that I had the best ever preparation for this season,” the beer-lover described her training prior to the Olympic summer. “I want to throw far in London. And if I throw over 70 meters, it also can turn to a gold medal,” said the 31-year-old Olympic champion from Beijing before arriving to London for her title defence. Surprisingly, she managed to defend her Olympic title quite easily. Her winning throw 69.55 stayed the world´s leading mark and she also defended her Diamond trophy. “In 31, I only showed what I was trained for and it paid off. It feels strange how easy it was this time,” summarized Spotakova, who had a special plan for the end of the year. After she was rewarded the best Czech athlete for the sixth time in a row, she announced her pregnancy. Spotakova´s son Jan was born on 24 May 2013 but the maternity leave did not last too long. Barbora decided to try throwing again already on 13 September at the local meeting in Domazlice. Her achievement 62.33 put her into the top 20 in the world that year and was significant sign of her shape despite the pregnancy break. “I could not even dream about a better season,” the 33-year-old Spotakova smiled after her 2014 season. The first season as a mother was more than successful – Barbora won seven out of eight competitions and that led to her third Diamond trophy. She won her first competition of the season in Rome (66.43), Prague (64.08), European team Championships in Braunschweig (65.57) and then also in Lausanne (66.72) and Monaco (66.96), her favorite meetings. 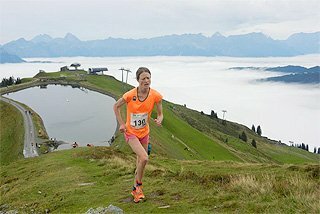 But in Zurich, she wanted her first European title too much. Prepared by Zuzana Trojakova for the IAAF ‘Focus on Athletes’ project.